Very few musicians have the means - or ability - to tour with an entire orchestra. Fewer still would dub the tour something as cheeky as 'Symphonicity' - e.g., a pun-laden reference to a blockbuster album. But that juxtaposition of the lighthearted and the refined summed up Sting's magnificent show with the Royal Philharmonic Concert Orchestra last night at the Verizon Wireless Amphitheater. The sweltering night began with two jubilant solo numbers, 'If I Ever Lose My Faith in You' and 'Englishman in New York', and then a pair of Police classics, 'Every Little Thing She Does is Magic' and 'Roxanne'. Starting the set this way was smart: By easing the audience into the orchestral experience with familiar tunes - instead of challenging them immediately with the unknown - Sting could push boundaries later in the set. And push them he did, for better or for worse. As expected, the pace of the night was slow and lingering - perfect for the atmosphere but at times a little too mellow. The night's most upbeat numbers were the most successful, in fact. 'Whenever I Say Your Name', originally a duet with Mary J. Blige from 2003's 'Sacred Love', became a funky, hip-hop-influenced heater with the addition of a violin solo and Sting's female vocal counterpart, Jo Lawry. (The song also threatened to segue into 'We'll Be Together' at any moment; a lost opportunity that it didn't.) A brisk, symphonic-rock version of the Police's 'Next to You' was another highlight. Orchestra director Steven Mercurio violently slashed his baton through the air, as guitarist Dominic Miller strode to the front of the stage to exhibit some traditional rock-god moves. Even Sting did a little air-kick at the end; the net result was a punk-rock orchestra. ​'Shape of My Heart' featured nimble, Spanish-influenced guitar work from Miller, while 'Tomorrow We'll See' felt like a burlesque Broadway tune with sharp brass accents; this added color made Sting's already-ornate songs livelier. The orchestra - and its animated conductor, Mercurio - deserve kudos for powering through the oppressive heat. (Reference: Saw a bank clock read 91 degrees at 11:15 p.m. while driving home. It was easily ten degrees hotter when the show started.) Anyone who's ever played a musical instrument knows that high temperatures and humidity are devastating to pitch, but the music was en pointe throughout. Soloists were strong, and Sting more often than not reverently watched them perform. It's important to note that the setlist was geared toward more-than-casual fans of Sting's solo career - not Sting generalists or Police fans. That doesn't mean the latter two groups couldn't (and didn't) enjoy the show. But the focus on deeper cuts certainly revealed the care and detail given to song selection: The rarity 'All Would Envy' sizzled like a steamy night in a Madrid club, and the Soul Cages tune 'Mad About You' (inspired by the "second book of Samuel, chapter eleven" in the Bible, Sting noted) was equally seductive. At 58, Sting looked and sounded far younger than his age - from his tanned skin and tufts of spiky hair to his pristine voice. The latter is partially a function of song selection: While some of the earliest Police stuff does have prohibitively high notes, Sting's solo work in the last decade conforms to how his voice has aged. But most of the vocal prowess had to do with pure talent. Most singers of his age have started to lose range. Last night, though, he leapt to high notes and dabbled in vibrato, and never sounded hoarse or weak, even as the set progressed. He also appeared to be completely enjoying himself and seemed relaxed and comfortable with the orchestra; he was chatty and told stories between nearly every song. This charm helped during the second set, when Sting made the audience earn 'King of Pain' and 'Every Breath You Take'. Before playing the Police hits, he ran through several deep album cuts. 'Moon Over Bourbon Street', from 1985's 'The Dream of the Blue Turtles', was a highlight. As footage of a full moon lazily moved across the stage screens, Sting put on a knee-length coat and disappeared into the song's main character, a vampire. He drew on his acting experience for evocative facial expressions, played the theremin like a deranged mad scientist and even howled like a werewolf at the song's end. 'You Will Be My Ain True Love', from the movie Cold Mountain, was also a standout; Sting vocal partner Lawry clicked on the lovely duet. Still, the pacing of this portion of the set dragged; the crowd seemed restless due to the lack of "hits," especially since the second act came after a nearly half-hour intermission. ​But starting with a strong, rollicking version of 'King of Pain' - which bizarrely fomented lots of frenzied, jubilant dancing, an incongruous response to the song's dour content - the night soared to its end. During 'Every Breath You Take', several couples slow-danced in the aisle. Fans (mostly women) actually started crowding around the stage right before the encore, which provoked more spice than usual during an energetic 'Desert Rose'. Sting approached the horde of people, took a bouquet of flowers and playfully shimmied like a flamenco dancer around the stage - much to the delight of the ladies in sight. The string flourishes swirling around the stage simply added to the dramatic sense of seduction. Sting's commitment to reinvention is admirable. While it's not always successful - see elements of the Police reunion tour - he's not afraid to challenge himself. That's obviously keeping him creatively fulfilled and energized, which no doubt explains why Symphonicity was so close to nirvana. ​Peronal Bias: Big fan of Sting solo and the Police since the early '90s. Notebook Dump: The stage setup was minimalist, but effective. Three large square panels separated into tinier squares by a grid hovered atop the stage. When they weren't featuring the musicians on stage, they projected works from ten video artists, including noted director Michel Gondry. The lighting was tasteful and subtle; color emerged when needed - for instance, deep red on 'Fields of Gold' - and never overwhelmed. 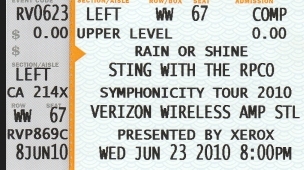 Sting often explained the origins of songs, Behind the Music-style, which added further levity and humor to the night. Before 'I Hung My Head', he noted a love of TV westerns (his favorite: Bonanza), and lamented, "I tried to write country songs but I don't look good in hats." ('This Cowboy Song' was not mentioned.) He told a touching anecdote about his late father, who was a milkman and bucked the familial trend toward the sea, before 'Why Should I Cry for You?' Meanwhile, 'The End of the Game' is based on the end of a couple of foxes; Sting had a fox invasion at one point and grumbled that they "killed all of my goddamn chickens." And he prefaced 'Tomorrow We'll See' with a long story about how the song came to him and it was "extremely disturbing" - it was about a "male transsexual prostitute." Writing the song, and exploring this darkness, taught him tolerance, he said. The Crowd: As a reporter for the Belleville News-Democrat pointed out, the crowd was extremely polite - they even stood in single-file lines to get into the venue and seats.